Simple, I wanted to break another record with a motorbike but speed records are far too expensive! While searching the Guinness site I came across a record for a long motorbike that I knew I could beat! My exact thoughts were 'here we go some big long useless thing, thats right up my street". 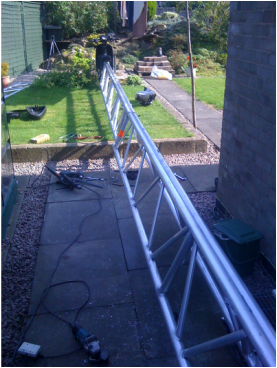 To start with I made the front and back first and fitted them to a small 4m long frame, just to see if we had any problems that we could sort before the big stretch. 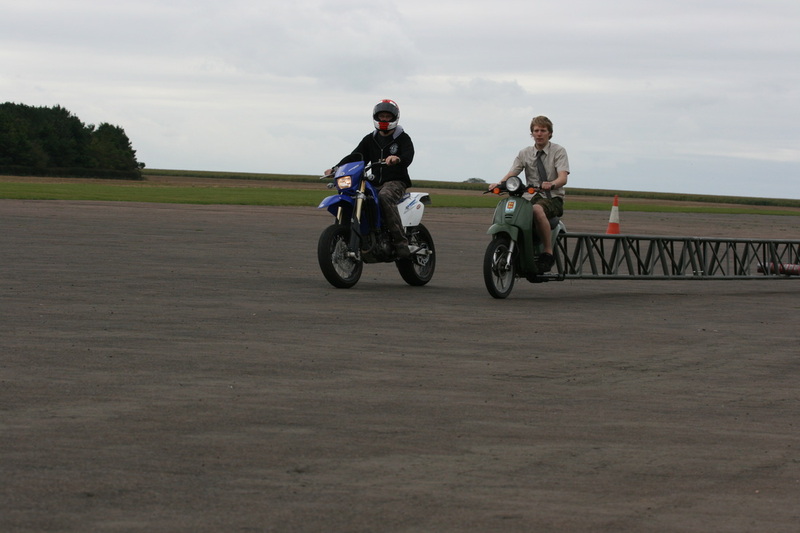 This was worth doing as we used a moped, the only control going from front to back is the throttle, and just a 4m long cable gave us problems with it sticking. We tried putting bigger springs in the carb and splitting the outer so just bare cable ran through the frame and these things did help but were not the final answer. In the end I came up with a very simple but effective system. Each end of the bike had the throttle pre wired and tensioned to a lever. 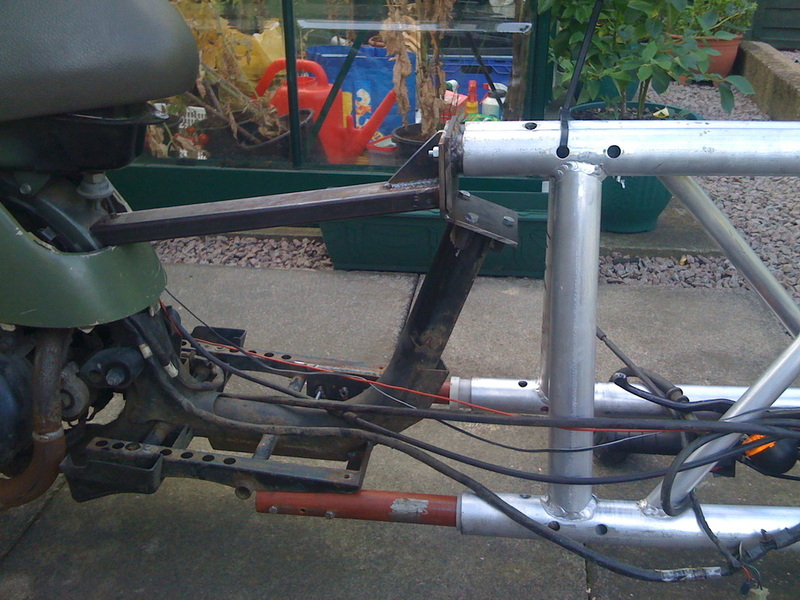 The levers were simply joined with aluminium mig wire and as this was so light, it could have a little slack in it but the throttle still stay tight at each of the ends it was perfect and even at 46ft felt like a normal throttle. 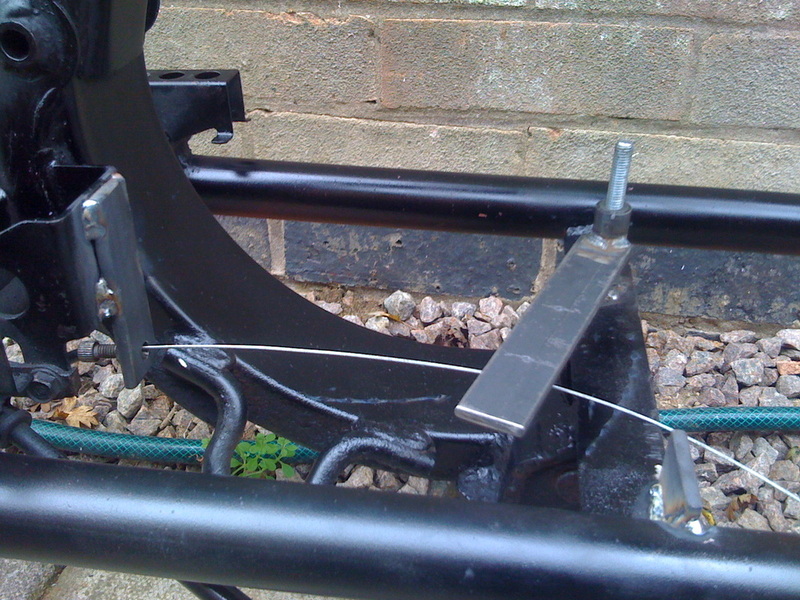 I used a scaffolding frame to separate the two ends of the bike as at the time it was the best option. At this time I didn't have welding equipment and couldn't afford any either, so I wasn't in a position to make it myself. 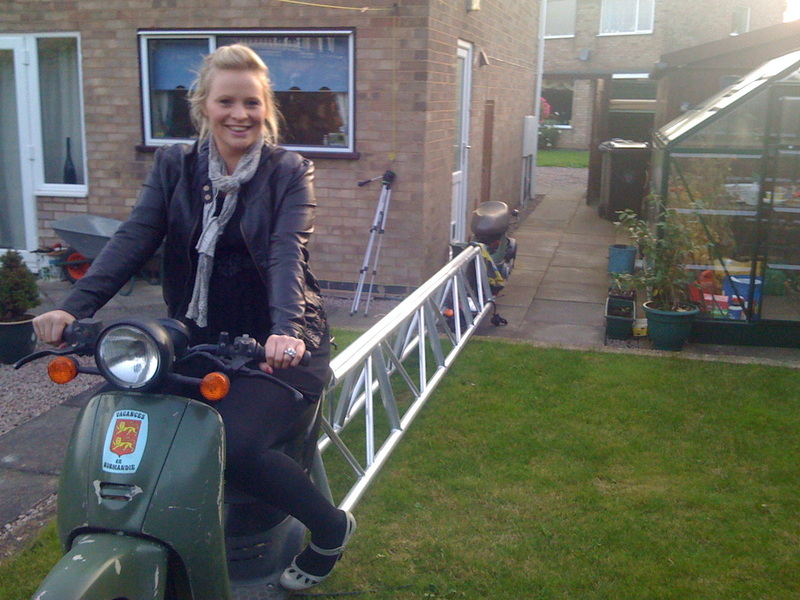 The beams were 8m and 4m in length and the bike had one of each down each side! They were clamped together with a series of bolts and threaded bar. The bike was surprisingly strong and you could walk along its length with minimal flex. Riding the bike was very strange, you could not turn the bars more than 45* as the weight of the frame would just want to pull it over on its side so small steering movements were needed! The way it moved however took getting used to, as on a normal bike you lean into a corner and go round, but this just sort of tracked to the side gently so good balance was required. The last adjustment came from a roll of lead stuffed in the middle to add a bit of weight as once going more than 10mph the frame got a bit of a wobble. The lead solved the problem! HAHA! Yes it didn't end there! After I'd been in the news papers a scooter company called Direct Bikes contacted me and asked, "CAN YOU MAKE A LONGER MOTORBIKE USING OUR BIKES?" So I thought yes free bikes, free ail and just go as long as possible which turned out to be 72ft! Thats as long as two busses! With going the extra length came a few more problems. The weight increase caused a concern that the front forks could snap at any point and the roll of lead now did nothing! I put two of the 8m beams on the under side to stop the bike snaking and this in turn lowered the centre of gravity and stabilised the bike. The steering was a joke, you just got lucky if you could keep it upright and straight, but it was just about rideable. Could you go longer? Maybe but I've been there and done it now, the most fun was had on the 4m framed bike as you could have a passenger and still ride it without too much difficulty. Although there are pics of the long one with around 25 people on it, you could not ride it and the frame would just be sat on ground hence the brick in the middle.